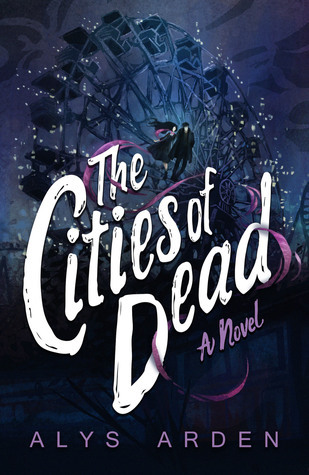 The Cities of Dead: the highly anticipated third book in Alys Arden’s spellbinding The Casquette Girls series. Old World witches collide with the French Quarter’s strangest denizens, setting off events that could tear the fabric of the Natural and Supernatural worlds, and only the most elusive, mischievous Voodoo lwa hold the key to stopping it. As Adele struggles with her The Cities of Dead: the highly anticipated third book in Alys Arden’s spellbinding The Casquette Girls series. As Adele struggles with her losses, Nicco’s secrets draw her closer, but Isaac questions Nicco’s motives and refuses to let go without a fight. While the coven works to make the streets safe from the Ghost Drinkers, Nicco’s family of vampires is ready to break the Saint-Germain curse at all costs and settle a centuries-old feud. To ask other readers questions about The Cities of Dead, please sign up. Alys Arden It is! I'll post as soon as I know more info about the release date. I still have to read the second book, but I am so excited about this one. This has to be one of the most intense love triangles EVER. I don't even know who to root for in the romance department at this point, and that's only one of the complications in the grander scheme of things! My head is still spinning, and I'm so glad we are getting more of this fantastic story with book four! Honestly, Adele and Isaac can make me feel so frustrated sometimes! Fortunately, I absolutely love Nicco, Codi and Désirée and half-love Gabriel, so I guess that makes up for all the things I don’t particularly enjoy! Isaac and Dee just want Adele back in the coven and they just want her present, but since Adele has isolated herself from them they go in with life and fixing the problems started in The Romeo Catchers. I would have given it one star, but since some of the side characters and the vamps are the best parts of the book, it warrants an extra star for that alone. I had waited long for this book and was looking forward to it, but having to read half of the book from the perspective of a mary sue, and I don't mean Adele, was just a pain to get through. as frustrated as I get with Adele . . . this was all kinds of crazy. in the very best way. Ok ok. So through most of the book, I was kind of like "where is this going?" Most of the characters (ok sometimes Adele and mostly Isaac) REALLY annoyed me. I also had no idea where the magic stuff was going in this book. I was (and still am) confused by a lot of it quite frankly. The Isaac/Adele/Nicco love triangle was a HUGE part of this book and it is extremely frustrating because we're supposed to believe that Isaac and Adele are in love, but they really don't trust each other. Also most of Ok ok. So through most of the book, I was kind of like "where is this going?" Most of the characters (ok sometimes Adele and mostly Isaac) REALLY annoyed me. I also had no idea where the magic stuff was going in this book. I was (and still am) confused by a lot of it quite frankly. The Isaac/Adele/Nicco love triangle was a HUGE part of this book and it is extremely frustrating because we're supposed to believe that Isaac and Adele are in love, but they really don't trust each other. Also most of Isaac's decisions regarding Adele are extremely selfish and self serving. (view spoiler)[Now we have new information that Nicco can play a really long game, so we don't really know if we can trust him either. (hide spoiler)] This is the first book in the series where I've been a little wary of Nicco but I still prefer him over Isaac. The last few chapters completely redeemed this book for me. Adele has been feeling completely useless since the loss of her magic and feels that everyone sees her as weak. Her final confrontations with Isaac pretty much showed that fairly clearly, (view spoiler)[side note: when she told him off I kind of cheered because that has been a LONG time coming. (hide spoiler)] Adele finally believing in herself at the end of the book was what got me excited for the next installment. Despite everything that happened in this book, I felt that she has grown a lot as a character. The last lines of the book had me feeling empowered and I felt that Adele could really do anything so I hope that energy carries into the final installment. This third installment in the series picks up soon after the devastating ending of The Romeo Catchers. Without drifting into spoiler territory (a hard thing. especially avoiding the ending of book 2), everything our heroes have been working toward is in shatters and they are trying to pick-up the pieces, while the threat from the newly revealed villain looms in the background. This is a transition novel taking up the groundwork set in book 2 and advancing us to some exciting possibilities in boo This third installment in the series picks up soon after the devastating ending of The Romeo Catchers. Without drifting into spoiler territory (a hard thing. especially avoiding the ending of book 2), everything our heroes have been working toward is in shatters and they are trying to pick-up the pieces, while the threat from the newly revealed villain looms in the background. This is a transition novel taking up the groundwork set in book 2 and advancing us to some exciting possibilities in book 4. But even though its a middle step in the story, this book delivers! Reading it I found everything from the earlier books intensified: the stakes for failure (both for New Orleans and on a personal level for just about every character) keeps soaring; and Adele’s relationships rise to dizzying heights and crushing lows on all fronts. Also, we get to know a lot more about what makes some of the other characters tick. Nicco in particular really took on new dimensions in this installment. The ending had me totally rapt and when it was over, I was looking for the next book in the series. If you enjoyed the first two books in the series, you’ll love this one. Arden fills it with all the adventure and suspense we’ve come to expect and also the moments of wonder and amazement, not to mention the enchanting Crescent City touches she does so well. This series just keeps getting better! Alys does an extraordinary job of keeping the story alive and interesting. The way she deals with grief and PTSD will bring you to tears and fill you back up with hope. I can’t wait for the next installment! What more could you ask, shape shifters, Witches, Vampires, Voodoo, Ancient Fueds And so much more all set in New Orleans. Review to come. As epic as anticipated. OMG... Amazing. At 800 pages, I figured this was the last book and realized at 80% there was too much still to resolve. Each word in this book is perfect. There are chapters in this book I wanted to instantly reread, because they were so moving. The characters grow and there is so much development you fall in love with each character all over again... or for the first time. But at the same time the characters stay true to themselves... the same selves they were in book one. I would have love to see a bit more of the new developments in this book, but it's long enough. Cover art is so spot on. I don't want to wait 2 years for the next book... I am willing to give 6 months. Must read this series, it keeps getting better and better. Every time I read a book from this series, I want to go to NOLA again. The third instalment in The Casquette Girls series was definitely worth the wait. It’s much more grittier, darker and sexier than the first two books and leaves you second guessing everything and everyone about their true motives where Adele is concerned. Honestly I could have whizzed through this book but I wanted to savour and enjoy, it plus there’s a lot of details and information to absorb spanning 400 years involving the Medici clan and the original family members of Ad She’s done it again!!! Honestly I could have whizzed through this book but I wanted to savour and enjoy, it plus there’s a lot of details and information to absorb spanning 400 years involving the Medici clan and the original family members of Adele’s coven. Ahhh I can’t even begin to describe how much I love these books!!! And Nicco.... oh lovely Nicco! This boy never fails to melt my mushy heart! I absolutely adored reading from his point of view, he’s such an intriguing deep and very misunderstood character. This is one of the only books where I do enjoy reading from all characters POV. Each of them is so beautiful and unique and such a joy to read. Although I could probably read this series forever 😂👌🏾❤❤❤❤❤❤ Ahhh I can’t even begin to describe how much I love these books!!! But I can't, I just can't. The main character is so self centered, whiny , immature....need I go on? The Casquette Girls series just gets better and better! I'll admit certain characters annoyed me a little at the beginning of this book (I'm looking at you Adele) but I was once again sucked into the world of New Orleans and magic. Alys writes so vividly that I wish I could visit so I could see everything in person, and I actually found myself looking up a lot of the landmarks mentioned so I could get a better picture. There are so many developments as far as relationships and friendships are co The Casquette Girls series just gets better and better! I'll admit certain characters annoyed me a little at the beginning of this book (I'm looking at you Adele) but I was once again sucked into the world of New Orleans and magic. Alys writes so vividly that I wish I could visit so I could see everything in person, and I actually found myself looking up a lot of the landmarks mentioned so I could get a better picture. Fantastic! Arden has created an amazing world and with each book I fall more in love with the characters living in it. The details from the rituals down to the clothing blew me away. It has all the emotional turmoil you would expect from a group of teenagers dealing with love, loss, and hard choices. Then throw in a whole lot of supernatural and it's a story that I couldn't put down. And I'm beginning to think the Coven aren't the only ones that can cast spells because The Cities of Dead is definitely magic. Ahhh! This book put me through the ringer and I loved every second of it. This series continues to get stronger and stronger and I cannot wait to see where Adeles new found strength takes her. If you're reading this review wondering if you should give this series a chance, you should. Not only does it have the magic of witches and vampires it has the magic of New Orleans. Well, it sadly took me almost a month to read this (I picked up other books in between). I just got to certain points and felt it lagged. I enjoyed the entire story but it lost me around halfway through due to its thoroughness. The last 100 pages picked it back up but it was a struggle to get to that point. I really do love these characters and the story but something didn’t work for me with this book. I’m hoping the next is non-stop action. Arden just wrote a 100 mile marathon that stops at the edge of a cliff. Where do even begin to describe Adele and how incredible she is flaws and all. Isaac and Nicco are these two strong lighthouses for her in her deepest times of despair. I can’t believe I am likely to have to wait another year to see how this intoxicating story ends. The way Arden blends NOLA essence/history with a gripping supernatural element is something magical. Another heart stopping page turner in this great series! I love these characters, the plot, and really anything about magical New Orleans! Adele is having quite a hard time in this one. Will she make the right choices before it’s too late?? We’ll have to wait and see in the next book to come of course!! Great author! Great series!! I highly recommend!! Alys Arden is a master storyteller. Period. This series is amazing. It’s almost impossible to review without spoiling, but I love the way she blends history with the present. I’m sad that book the next book will be the last in the series, but I know any story that Ms. Arden writes in the future will be pure magic.